It’s the day after the 2019 Golden Globes, and all anyone can talk about is the girl in New Céline. 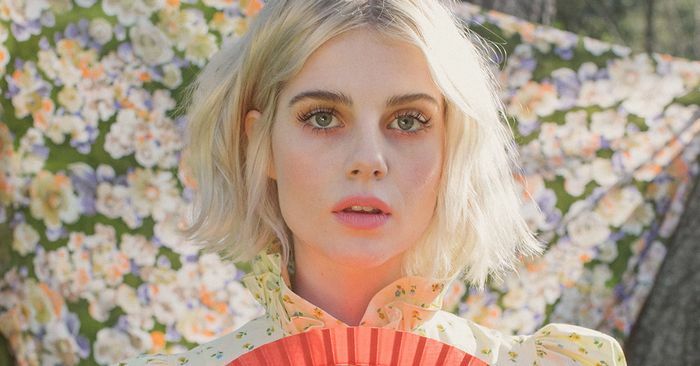 They could be talking about Lady Gaga in custom Valentino or Emma Stone in Louis Vuitton, but the digital glitterati only has eyes for Lucy Boynton, the 25-year-old British breakout ingenue from Bohemian Rhapsody, a Best Picture nominee at this year’s Oscars. “Who is she?” may be a meme, but it’s also the question I hear uttered breathlessly around the Who What Wear office for the next several days. Who is this fresh face with the blonde bob making her debut in head-to-toe gold from one of fashion’s buzziest designers? Is she some sort of fashion savant? A spy? What is her agenda? Who is responsible? On red carpets, Boynton counts Prada, Miu Miu, Gucci, and (especially) Erdem among her favorite designers to wear—they’re the ones that encourage her to let her freak flag fly. Boynton recalls working with Prada for a red carpet premiere in 2017: “At first I put on this very appropriate black lace thing, but it just didn’t feel like me. I think you can tell when I love what I’m wearing—and you can tell when I don’t. Prada wanted me to feel like myself.” Boynton wound up choosing a baby pink pajama set patterned with robots, which she paired with an equally pink coat and silver platform shoes. “It was slightly aggressively out there,” she says, “but it’s still one of my favorite outfits.” The designers let Boynton keep the PJs; “I now I basically live in them,” she gushes. As Boynton continues to catapult forward professionally (in her next major project, she’ll play a lead in Ryan Murphy’s new Netflix comedy series, The Politician, coming later this year), she’s open to her style evolving and has no strategy in mind other than only wearing what makes her feel most authentically herself. “So as long as I feel right in an outfit, I will never regret it,” she says. When begged to give us a hint about her upcoming Oscars dress, Boynton grins and takes another coy sip of Diet Coke. “I’ll just say it’s a custom dress by designers I’ve been obsessed with for a while. They’ve been sending sketches,” she says. “I’m very, very excited.” Watching eagerly from afar to see what our new favorite fashion star of 2019 will do next, so are we.